V For Vegan is a month-long festival of all things vegan - food, clothing, wellness - taking place around Shoreditch and Spitalfields in August 2018. 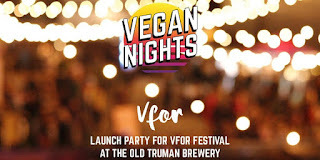 To kick it off they are holding a special edition of the monthly Vegan Nights street food night at 93 Feet East at 150 Brick Lane, on Thursday 2nd August. There will be 20 traders there, and tickets cost just £7 from here. Full V For Vegan programme details are here. "V For will be kicking off with a special edition of the already well-established Vegan Nights on the 2nd August. The foodie favourites from the much-loved night market, who welcome over 2000 monthly visitors, will be on hand with an exhaustive selection of delicious vegan treats. London’s monthly Vegan Nights festival is back on August 2. Branded a must do by Time Out, who said "that Vegan Night festival was so insanely popular, it’s coming back". Well, they weren't wrong. Not only are there over 20 insanely nom food vendors - dealing out the best in veg-based snackery - but there's also DJs, live acts and warm vibes - as well as, we hope, warm weather. Save an animal - eat at Vegan Nights. Elsewhere, explore innovative edible offerings at both Juju's and Ninety One, as they offer new vegan menus in solidarity with V For on the 11th and 12th August. Similarly, Brick Lane Food Hall will be opening its doors to exclusively vegan and vegetarian food traders for the first time ever on the 4th and 5th. There will also be an immersive vegan exhibition courtesy of Plant Pop, promising an all-encompassing sensory experience, from the 7th August to the 4th September. Meanwhile, champions of American Mexican fusion, DF/Mexico will be launching their own vegan menu during V For as part of their ongoing offering on Hanbury Street." V For Vegan will be at locations around Spitalfields, including extablished stores like Adidas, and resturants like Rosa's Thai Cafe.